Think of fashion, think of Sarojini Nagar. One of the fashion hubs of South Delhi, fashion is at throwaway prices. Products of reputed brands which are export surplus come here and they can bought at cheaper rates. If you are looking for that exact fitting, dress which you can try first and then buy, Sarojini is not the place for you then. Mostly street side, mobile shops is what makes up for the fashion street, besides which you need to really expert the art of haggling. 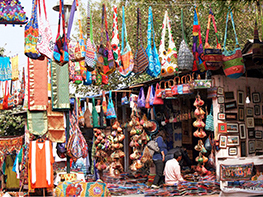 Shop your Heart Out at the Fashion Capital of the country!